Perhaps one of the most difficult parts of new parenthood is carving out moments to just be me. 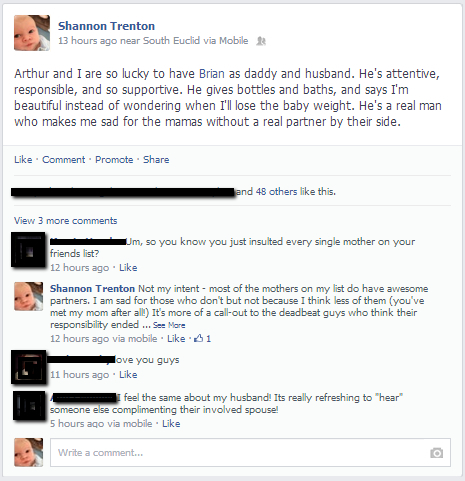 I am Arthur’s mom but I am also Shannon, Brian’s wife and an individual with my own needs and identity. I have an extremely supportive family that gives me the space to be my own person; the challenge has been making the most of that time and space. It was perfect timing, then, that my friend Alicia posted pictures of a 30-day physical challenge she is doing to stay on track with her health and fitness goals. I had just been considering a membership to Planet Fitness, but decided that I wanted to start smaller – something I could carve out the time to do without needing to find a sitter or wait for Brian to get home. My first idea was mall walking (which I am totally going to do, and treat myself to coffee while I’m at it! ), but these challenges also seemed like something I could work in to my daily routine. If you haven’t seen them, there are three challenges: an ab challenge, combining sit-ups, crunches, leg raises, and planks; a squat challenge; and a push up challenge. They were designed together so all of the rest days are the same, and each challenge is progressive so you continue to build on the work you’ve done in the days before. By the end of the challenge I should be able to do 125 sit-ups, 200 crunches, 65 leg raises, a 2-minute plank, 250 squats, and 20 push ups. Day 1 – Monday – was a breeze, as the first day of any fitness program usually is. Whether you visit the gym with a brand-new workout ensemble and a sparkling water bottle to attack the elliptical or do crunches in your living room, the adrenaline rush of doing something is usually enough to help you power through the workout. Day 2…yeah, that’s when the realization sets in that it’s called “working out” because it really is work – and if your body is like mine, it doesn’t like being forcibly reminded that those muscles are there to serve a greater purpose than they have been. I did learn, though, that squatting in front of a baby is the most hilarious thing in the world – to the baby. Arthur was more than amused by Mommy’s feeble exercise attempts, though I’m sure he was also confused about why I kept bending down toward him without picking him up. I wanted to quit, so badly. I did the whole routine yesterday, up to the sit-ups – 8 crunches, 8 leg raises, a 12-second plank, 55 squats, and 4 push ups – and sat there for a minute wondering if it would be so bad to just skip the sit-ups and start again today. But I guess parenthood has changed that part of me too; I looked at Arthur, sitting on Brian’s lap looking down at me from the couch, and realized that I can’t expect or encourage him to keep going through challenges or adversity if I’m not willing to do the same. And I don’t get to put a check mark on the calendar if I only make half an effort. So I did it. Five at a time, slowly at first and then powering through as I got closer to the finish, and my abs were screaming when I was done. But I did it. The next challenge will be overhauling the way we handle food in our house – replacing snacks, establishing and sticking to a consistent dinner schedule, and just developing a better relationship with what we put into our bodies. In a little more than a month we will be introducing solid foods to Arthur, and once again we can’t expect him to have a healthy perspective about food if we don’t model that for him from the beginning. In other news, I’m on a mission to simplify my life. Physical clutter leads to psychological and spiritual clutter, and all of that stands in the way of enjoying all of the wonderful parts of our life. On Monday my friend Amanda posted on The Color Coded Life about a planner that she loves (I am addicted to planners myself) that is designed to – you guessed it – help you simplify your life. It carries a hefty price tag, but the temptation was too great to resist so I treated myself with the proceeds from my paid book reviews. It should arrive next week, and I can’t wait to get started. Once this lovely planner arrives I’ll do a more in-depth review of it. Who knows, I may even break out the Flip and do a video. We all need to stick together. Last night, Brian was telling me about his “friend” whose girlfriend had their first baby last week. Throughout the pregnancy and since the birth all I’ve been able to do is shake my head and feel so profoundly sad for the girlfriend – yes, she knows what kind of person she’s with, but when she got pregnant I imagine she thought he would step up and be a worthwhile partner. She’s been disappointed (or, I guess, I would be disappointed if Brian had turned out that way). Yesterday I finally couldn’t take it anymore, so I spoke out on Facebook. I tried to say what I needed to say as diplomatically as possible. I really am grateful for Brian, and I really do feel sad for women who don’t have a real partner by their side. While my intent was to call out partners who aren’t acting right, though, the comment above opened up a whole new train of thought in my head. Like I responded, I didn’t intend to do that. Feeling sad for the single mothers certainly doesn’t equal feeling sorry for them. I was raised by a single mother, and I am still in awe of how she managed to juggle everything essential and still had the energy to participate in school events, ask about our days, and genuinely enjoy us. My mother loves my brother and me fiercely, generously and completely, like every single mother (and father) I know. She loves our spouses, and her grandchild, just as much. I am insanely proud of the woman she is, and I am sad for her. The fact is, the vast majority of single parents don’t set out to be single parents. There are some outliers who choose single parenthood for their own reasons, but far more parents bring a child into the world and their partners slip out of the picture somewhere along the way. I’m not trying to lord over my fellow parental warriors when I say I’m sad for them. I don’t know what it’s like to be a single parent, but I know that it would be the greatest slap in the face to offer any single parent as condescending a sentiment as pity. Instead, they have my admiration. And my support, as does every parent who is making a legitimate effort to do their best, whatever their best may look like. If I pity anyone, it’s the partners who choose not to take an active role in bringing up the beautiful life they had a part in creating. Parenthood is a unique and dynamic journey. Those who choose to take that path – biologically or otherwise – need to stick together. After nine weeks at home and eight weeks of near-24/7 Arthur time, this Monday morning I started back at work. I took more time to get ready to walk out the door than I had in weeks. I put on a new dress, and heels, and jewelry, and I even did my makeup. I packed my bag, and a lunch, and gave our awesome nanny everything she would need for her quality time with le bebe, and then I ever-so-reluctantly walked out the door and left him. What made it difficult was not the fact that I would be gone. He’s in the best possible hands that aren’t Mommy’s or Daddy’s, and I was actually looking forward to coming back to the office. I’ve left him for a few short spells in the last couple of weeks. No, what made it difficult was knowing that I would be giving a mid-morning feeding to a machine instead of to my little man. Instead of watching him drift off to sleep I will be staring at a lump of plastic and listening to its whirring instead of his breathing. I will be gone for more than 8 hours – not so much that I’m afraid he’ll forget me, but enough that he may wonder if I’m ever coming back. Nine weeks…and it’s so surreal. Now I’m near the end of my first week back in the office (three days in, two days out). It’s different in so many ways; not only am I still transitioning to being back in the work force, if only part-time, I am also getting used to a new job description. The office didn’t exist in a vacuum during my absence, and my return was orchestrated to make the best use of the staff on hand – which means, because of my time with the company, that I was best suited to take on different responsibilities entirely from what I was used to. It’ll take some time to really settle in to my new role, especially before I’m really used to being away from Arthur for these long stretches. I will say, though, that walking in the door after a day at the office is, once again, my favorite part of the day. 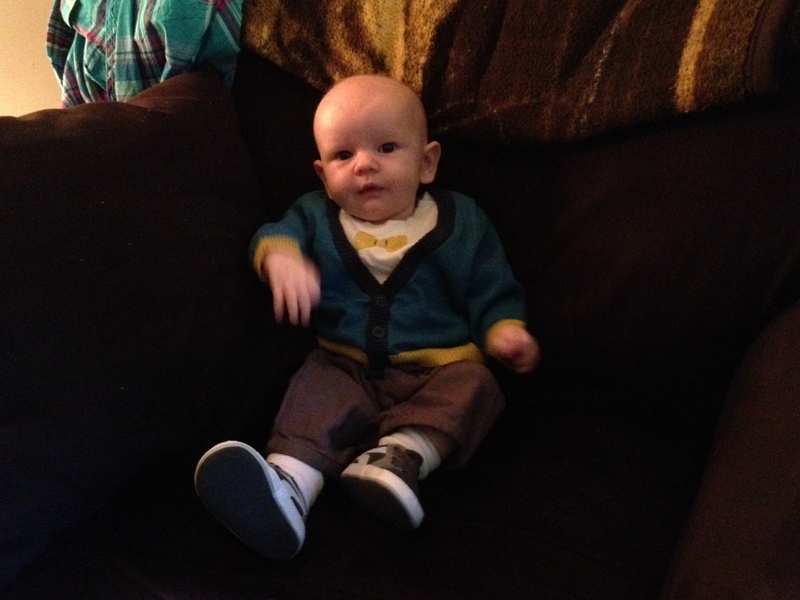 Arthur will be two months old on Sunday – I can’t figure out where all the time has gone. Second-guessing oneself, I’ve learned in the last six weeks, is probably the most consistent side effect of new parenthood. It’s a good day for me if I can count on one hand the number of times I’ve questioned whether I’m doing things right or if a particular crying jag is going to irreparably damage Arthur’s young psyche. (Today’s upset over a gassy tummy, for the record, falls into that category.) I don’t know if an inferiority complex will show up on any exam, but I’m fairly certain I’m developing one. Breastfeeding has been my biggest source of anxiety from the beginning – in fact, since pregnancy. My mother was never able to breastfeed, and I don’t know that my grandma ever tried. The unfortunate psychological side effect of that is that my mom’s attempts to be supportive have all been laced with, “I hope you can breastfeed, since I had so much trouble with it.” Thanks, Mom. Super encouraging. Arthur’s weight gain has been an uncertain development, which added to the concern on my end. He was 8 lb 9 oz at birth, and I don’t know what his weight was right before leaving the hospital a day and a half later. The next day was his first check; the doctor’s (old) baby scale was broken, so they took his weight by weighing me* and then having me hold him. He was “about” 8 pounds. According to the baby scale, fixed at his visit two weeks later, he still only weighed 8 pounds even. Our doctor** wasn’t concerned – he said we would discuss it at his one-month check if Arthur still hadn’t gained weight. Our one-month appointment was last week. 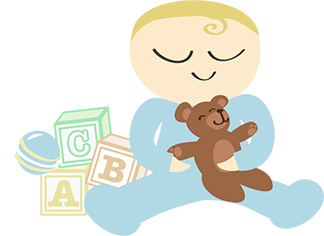 The baby scale weighed him at 8 lb 10 oz, still well below the 50th percentile according to the WHO’s baby growth chart, but a healthy gain of about 5 ounces a week. Now we’re on to the next adventure: pumping. *I gained 17-20 pounds during pregnancy – I lost 20 pounds between my last OB appointment (Monday) and Arthur’s first appointment (Friday).